Hi! 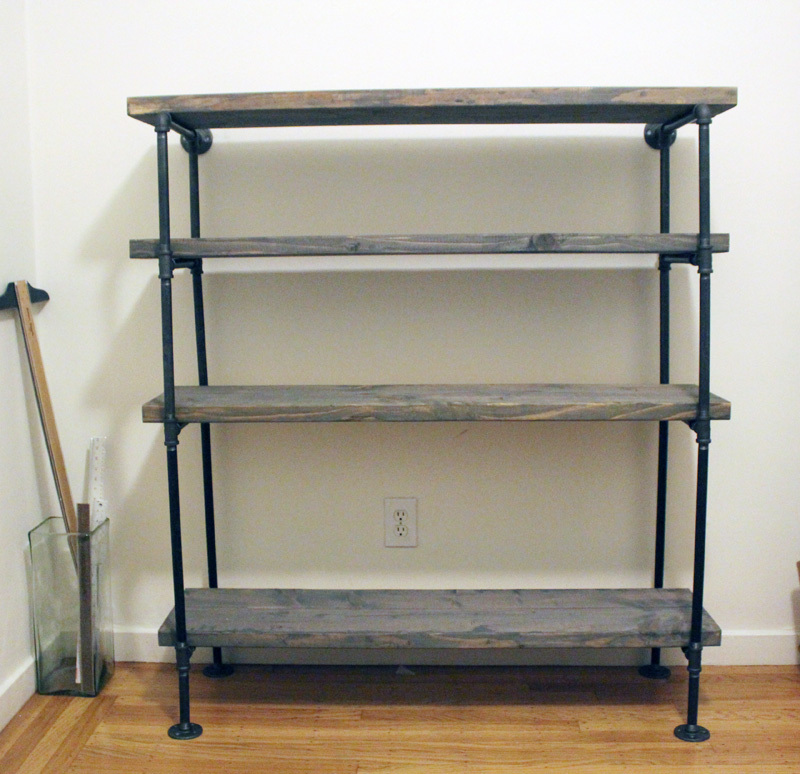 It’s about time we went ahead and built the shelf we bought all of the materials for in the last DIY: Shelf post from a couple of weeks ago. First thing to do is lay out some old pieces of cardboard to be able to stain the untreated wood without making a complete mess. 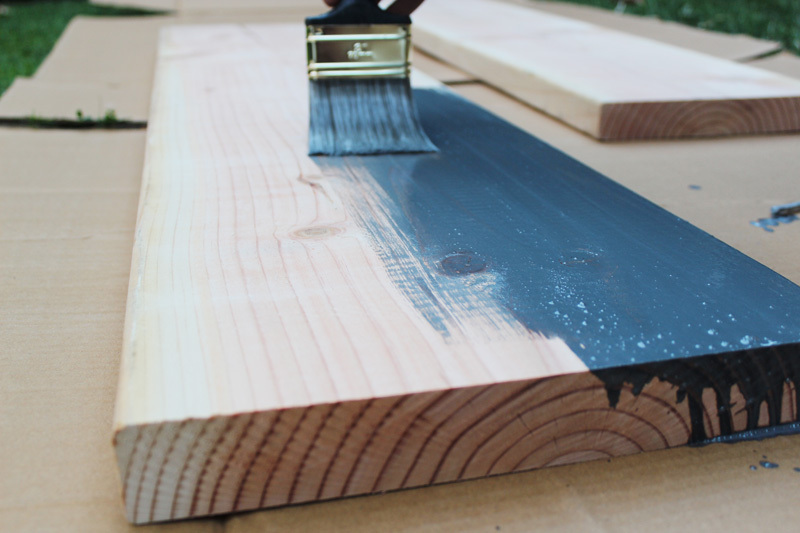 Use a brush or sponge to lightly stain the wood, wiping the excess stain off of the wood after allowing it to dry. The longer you let it dry, the darker the stain will be. I let my stain dry for about 5 minutes before wiping the excess off. Apply the stain evenly, and watch for extra drops or pooling. 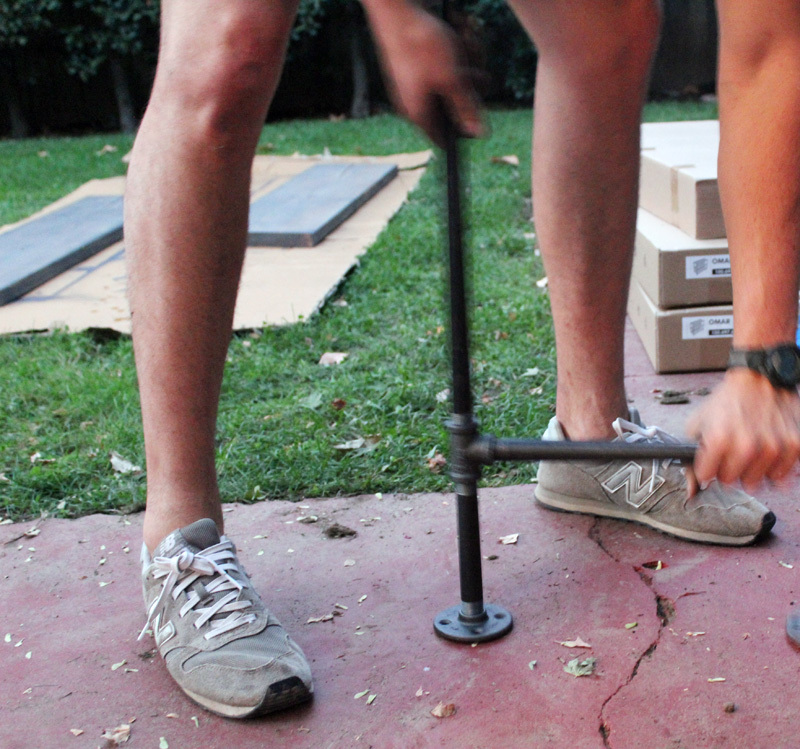 The second step is to actually build the frame of the shelf. 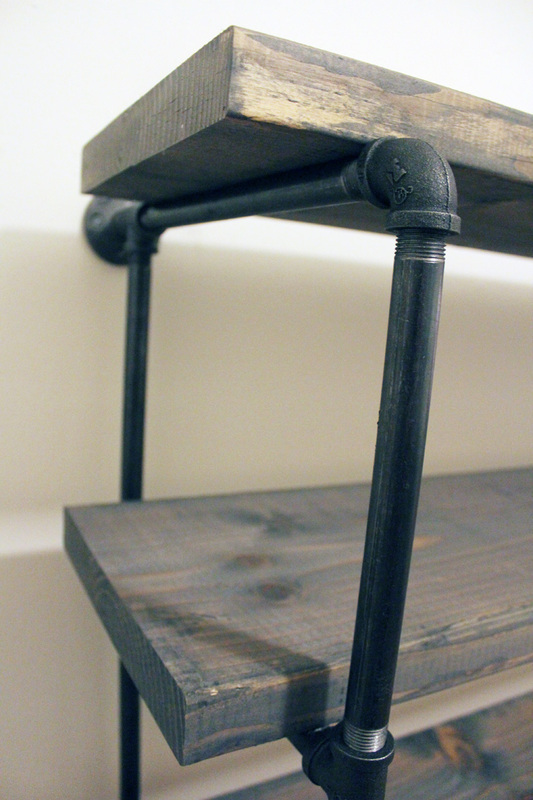 Each piece of piping is simply screwed together, no tools needed! You just might want to enlist the help of a big strong man to help secure the joints:) Another tip is to wipe the pipes clean before beginning to build it, they are pretty dirty. OR you could spray paint them to create a completely different look and feel- maybe a neon color pop! And finally once the frame is built and the boards are dry you can place each wood board onto the different shelves. The final touch is to screw it into the wall at the top of the entire piece for stability. Now that the piece is built it is just waiting for you to fill it with all of your favorite things! I’ll share how I glammed out my rustic shelf with design books, antique finds and personal touches in the final DIY Rustic Shelf post! 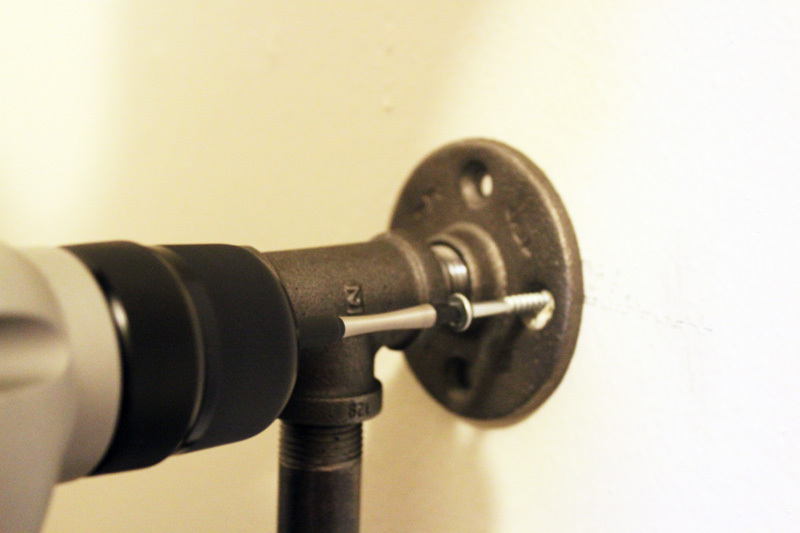 Do you need the top flanges to secure to the wall? I want to make this but we are renting so cannot put any holes into the wall, is it fairly stable without the top flanges screwed into the wall? You don’t need to screw it into the wall, but he is using the wall as a brace, so you would need some kind of cross bar support going across the back of the shelving. You have probably seen this on other shelving systems and is fairly easy to achieve using tie-rod assemblies (should be able to find in any large hardware store). Also consider making the shelves a little deeper as that will increase the stability of the base. know the reason why I am unable to subscribe to it. how do you connect the last piece of the ‘square’? do the pipes have to be reverse threaded? ah, finally read the comments. tighten and then back out the horizontals to simultaneously screw them into the opposite side T. got it. fwiw, we tightened everything really tightly the second time (meaning vertical pipes into fittings, as well), and it made a huge difference in the overall integrity of the shelves. other tips: Lowe’s didn’t have all the lengths we needed in one specific color. they had some in galvanized (silver) and some in ‘black’ pipe. the black was either really dark pipe that doesn’t look coated or black coated pipe, and none of the pipe matched exactly to the color of the fittings (elbows, Ts, flanges) – they were all that dark, charcoal grey pipe color. HD had a better selection aesthetically. 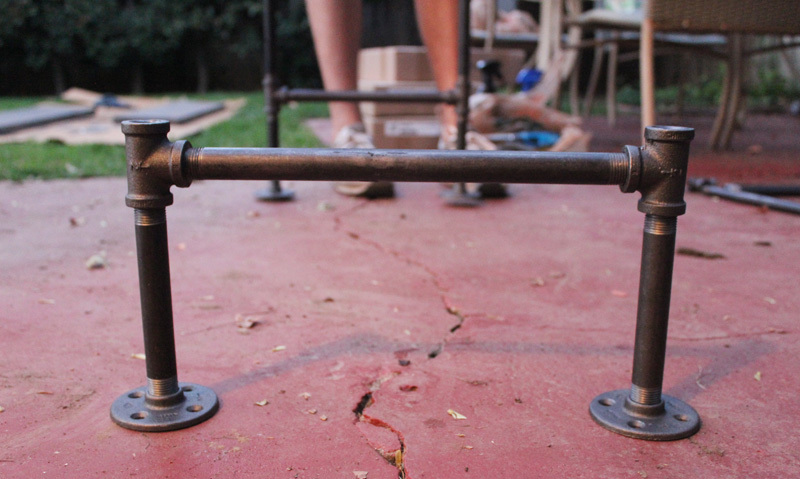 also, we had to have some pipe cut and threaded to complete our list – HD didn’t have enough pre-cut to fill our order. the pre-cut stuff all has two stickers on each pipe. Goo Gone works great to get them off, but it was a very timely endeavor removing two stickers from each of several pipes. if you have the time to wait (drop and leave), have them cut/thread all the pieces you need for the project. this reduces greatly the amount of time you, specifically, put into this project. 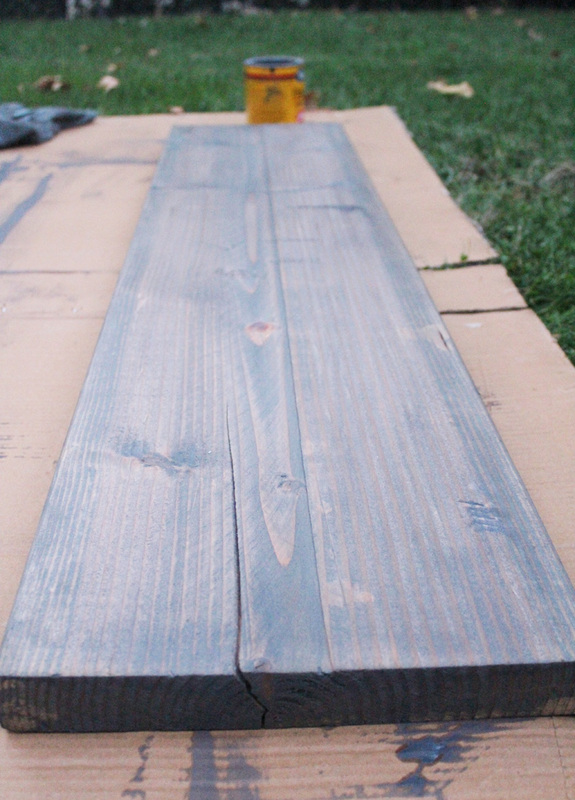 make sure the ‘planks’ – 2x10s or 2x12s or whatever – are not warped too badly. and if cutting the boards in half to make deeper shelves (we used 5′ lengths of 10′ [cut in half] 2x12s side by side to make 5′ wide, 24″ deep shelves) mark the pieces of the planks so that they get used together. this gives you a better chance of having them fit together the best. Hello! I too am trying to figure out how to connect the last piece of each ‘square.’ I’m not sure what this mean “tighten and then back out the horizontals to simultaneously screw them into the opposite side T.” Would you be able to elaborate? I LOVE these shelves! They are really fun and I love how rustic the wood is! 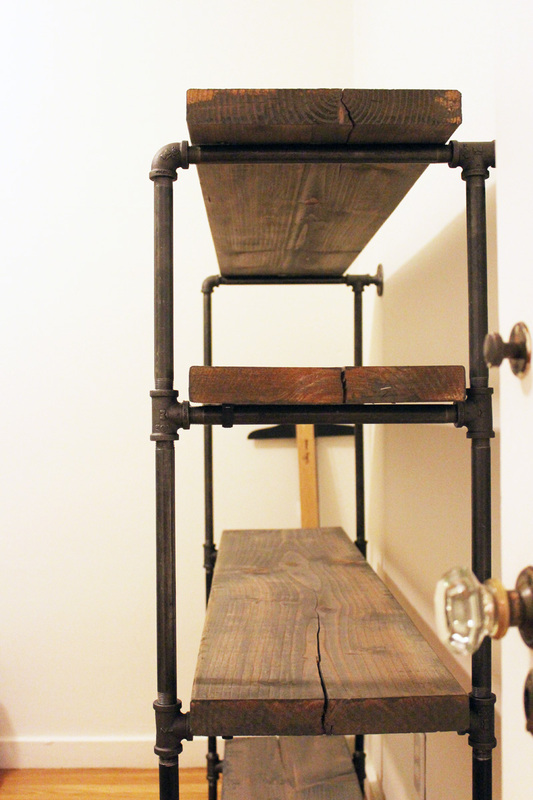 These were actually one of our inspirations when we were making our own industrial style shelves, check it out here! i am slightly confused as to where you used the 1/2″ by 2″ pipes. There were only 2 listed. Any help? Hi, I was wondering if you found that the shelves started bowing in the center since there does’t seem to be any support under each shelf? The boards we used were thick enough to not bow. Also- the length of the shelf was not very long so we didn’t need to worry about the middle sagging. If you are doing a long shelf, I would add one more support in the middle. Hope this helps! it’s been a while, but here goes. you need to tighten/thread the pipe all the way in on one end and then back it back out/unthread it as you simultaneously thread it into the coupling at the other end. doing this you’re loosening it at one end and tightening it at the other at the same time. the key is finding the sweet spot of tightness at each end of the pipe. Love your design. But how do you screw in a complete square section. Once I have 3/4 of a section it is too rigid to complete the final connection. As I screw in a cross piece it unscrews from the other end. Please help. This does happen a bit just with the nature of the pipes, but if you over tighten it on one side, then start to twist in the second side, you can get a balance between the two that is strong. I don’t recommend this for shelving that will be holding significant weight! But it has been great for small books and treasures that I have used it for.